This item will ship on Thursday, April 25.
resources, and authority. Whether getting fuller support from the marketing department, hammering out next year's budget, or winning the approval for a new line of business, managers must be adept at advantageously working out and modifying understandings, resolving disputes, and finding mutual gains where interests and perceptions conflict. 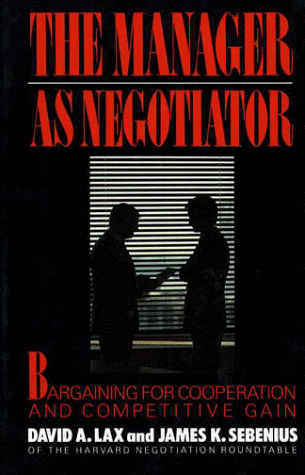 In such situations,The Manager as Negotiatorshows how to creatively further the totality of one's interests, including important relationships -- in a way that Richard Walton, Harvard Business School Professor of Organizational Behavior, describes as "sensitive to the nuances of negotiating in organizations" and "relentless and skillful in making systematic sense of the process." This book differs fundamentally from the recent spate of negotiation handbooks that tend to espouse one of two approaches: the competitive ("Get yours and most of theirs, too") or the cooperative ("Everyone can always win"). Transcending such cynical and naive views, the authors develop a comprehensive approach, based on strategies and tactics for productively managing the tension between the cooperation and competition that are both inherent in bargaining. Based on the authors' extensive experience with hundreds of cases, and peppered with a number of wide-ranging examples,The Manager as Negotiatorwill be invaluable to novice and experienced negotiators, public and private managers, academics, and anyone who needs to know the state of the art in this important field. David A. Laxis founder and co-director of the Negotiation Roundtable at the Harvard Business School. An Assistant Professor of Business Administration there, he teaches an extremely popular negotiation course. Educated at Princeton and at Harvard, from which he holds a doctorate in statistics, he has written extensively on negotiation. As a principal of The Negotiation Group, Professor Lax frequently acts as a consultant to business and governments. He lives in Cambridge, Massachusetts. Creating Value, or Where Do Joint Gains Really Come From? What Does Any Manager Have to Worry About?